Today is Diwali, the most important Festival in the Hindu religion. Hindus will light clay lamps to signify that the light inside their souls has triumphed over the spiritual darkness. People wear new clothes, decorate their homes with lights, and light fireworks to celebrate the festival. It’s their version of Christmas, with children receiving gifts and sweets. Working with Indians and traveling to India for my job, I’ve learned a lot about Hinduism over the years and find that it helps me gain insights into Mormonism. The most common misunderstanding of Hinduism is that it’s polytheistic. The variety of Gods sometimes with animal faces and with apparently strange roles is hard for Westerners to understand. But Hinduism is actually monotheistic, with all the “lower” gods being representations of the same One God. Gods can be categorized under two headings. “Nirguna Brahman”: the one God and Supreme Being, a formless and impersonal supreme being without qualities or attributes–and comparable in a general way with the way Christians perceive God the Father. This One God Cosmic Being, is made up of two parts, male and female component (Heavenly Father and Mother?). The second is “Saguna Brahman”: the personified, personal forms of the supreme reality that is worshipped as God. This is similar to how Christians perceive Jesus Christ, and in Hinduism there are three main Gods of this type (Brahma, Vishnu, Shiva), each with various incarnations and representations. It is said Hinduism has thousands of gods. It is important to note that these are not two different realities, but rather two different ways of perceiving the true ultimate reality; the first is perhaps more the subject of philosophical and intellectual speculation and meditation, while the second is more the object of adoration, sacrifice, and devotion. The multiple incarnate Gods signify a certain aspect of God: creator, ruler, warrior, scholar, nurturer, healer, etc. 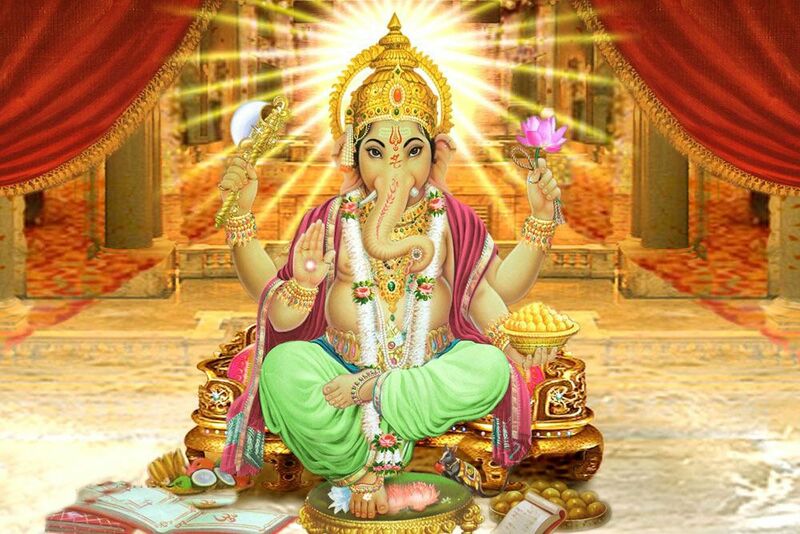 One of the most popular Hindu Gods is Ganesha, portrayed as an Elephant with four arms. Just like Hindus believe God took a body (number of times) and came to Earth to show mankind different characteristics about him. Mormons also believe God took on a body and came to earth and lived as a man to show us characteristics about him. Hindus believe the divine resides in all beings. the greeting “namaste” references the divine in one person acknowledging the divine in the other. The Hindu doctrine of incarnation is not entirely different than the Mormon doctrine of eternal progression. Hindus don’t believe in a Heaven/Hell concept, but rather that life is for the purpose of becoming like God. You retain the progression you made in this life into the next life and continue progressing until you achieve “exaltation”. The difference being that in Hinduism the next life is another birth into Earth. Mormons LOVE Holi, the festival of colors, when the Krishna temple in Spanish Fork is submerged by locals showing up to spray colors on each other. Strict code of ethics, commandments, and moral law. Hinduism is facing the same tension other religions are experiencing related to scripture literalism. In Hinduism, it’s not as severe, because their myths are dated much further back in time. And also because Hinduism doctrine is very fragmented, and it is more of a religion based on orthopraxy (right doing) vs orthodoxy (right believing). But the tension still exists. Ask ten Hindus if they believe the foundational myth about the Goddess Ganga and the River Ganges to be literal/actual history or simply metaphorical, and you will get a range of very passionate opinions. Some will go so far as to say if a story like this could be proven false historically, it would destroy the entire religion. Others think that idea is absurd, understanding the value is in its spiritual application not its actual history. Marcus Borg uses a concept from business merchandising to make a comparison of wholesale God/religion vs retail God/religion. He makes the case that all religions believe in the same wholesale God. Every religion starts with the basic component that there is an all knowing, all powerful God that loves us and wants us to be good to each other. This is like a wholesale merchandiser that keeps the product very generic. Then different retailers will take the same product and package it in their own unique way to communicate it. He compares this to the religions of the world, who all express the basic wholesale God/religion message and personalize it. In this sense, I can view Mormonism and Hinduism as two very similar religions. At the wholesale level, we are the exact same. We believe in a God that is the Supreme Being that loves us, that life has a purpose, and that we should be good to each other. Then around this “wholesale” core, we wrap around our own “retail package” to make it more personal and easier to understand and relate to at the individual level. I’ve heard the word “namaste” before, but never knew what it meant. It’s a beautiful concept. “Polytheist” is something of an epithet these days, the kind of charge that monotheists (and everyone *thinks* they’re a monotheist) tosses rather freely at their religious opponents. Jews and Muslims have the strongest case for being true monotheists, but even they have a whole variety of angels and demons, some named and some anonymous, in their cosmology. These are no different from the variety of semi-divine beings that populate Greek mythology and that we have no hesitation in seeing as polytheist. Trinitarian Christians and Tritheist Mormons have a weaker case for objectively claiming the monotheist title. LDS leadership having recently welcomed Mother In Heaven into the Mormon pantheon, I guess we’re Quadrotheists now. Anyway, I think it’s a real stretch to bring Hinduism under the monotheist banner, although there are no doubt “God of the philosophers” types in Hinduism who feel like monotheists and I’ve even heard there are non-theistic Hindu branches, much like Buddhism. More interesting than expected. Thank you! Sounds like modalism. A Christian heresy, but then almost anything is a Christian heresy if you look hard enough. I think i’m a henotheist. But I don’t mind being called a polytheist: God the Father, Mother in Heaven, Jesus Christ, the Holy Ghost, and let’s not forget Prez Snow’s couplet.